Earn 1 reward point for every dollar spent on Eligible Transactions. Complimentary International Travel Insurance, Interstate Flight Inconvenience Insurance, Purchase Cover Insurance and Guaranteed Pricing Scheme (terms, conditions, limits, and exclusions apply)4. Fees and charges apply. 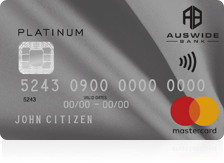 Terms and conditions apply and are available at https://www.cardservicesdirect.com.au/cardservices/useful_forms.htm. Citigroup's credit criteria apply. Current Card Services Credit Card holders are not eligible to apply for these introductory offers. Offer ends 31 July 2019. Post this date, we reserve the right to continue, withdraw, or change the offer at any time without notice. Subject to your acceptance, you will not be charged an annual fee while you are a Freedom Package home loan customer with Auswide Bank. Please note, you must apply over the phone or in branch for this type of offer. © 2019 Card Services is a division of Citigroup Pty Limited ABN 88 004 325 080, AFSL No. 238098, Australian credit licence 238098, which provides and administers credit on behalf of Auswide Bank Ltd. ABN 40 087 652 060, AFSL No. 239686, Australian credit licence 239686.